Take a trip, if you dare, to a place where this world and the next become one, where the dead and the living dwell side by side. Follow Olivia Claiborne, her son Cole, and their beloved cat Minou as they uncover the truth about the ghostly haunting of the cemetery and find the lost tomb of Penumbra, Sorceress of the Dark Continent. In this twisted tale of the tragic times of the past and the unsettling times of the present, we find hope in the future. Discover the answer to the mystery of the amulet of Montegut and learn the lessons of loss, mourning, acceptance, and perseverance. Join the cast of remarkable characters who assist the Claibornes in their quest. 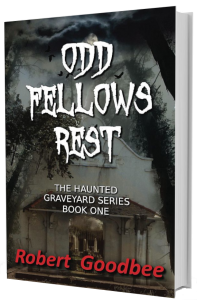 Let them lead you to the only place where such a story could happen – a forgotten cemetery in New Orleans; a place called Odd Fellows Rest. 5 Stars – It is creepily original and excellently written. I didn’t put my Kindle down even one time. 4-5 Stars – A great mix of supernatural lore, history, mystery, and suspense. A little spooky, and ghoulishly entertaining. 4-5 Stars – Seriously sinister side, but all done in a fun and creative way. The characters felt real and not contrived. 4 Stars – Easy to keep reading because it was just so interesting and strangely believable. 4 Stars – Curses, ghosts, demons, pirates, witches, powerful relics, mystical people, and it wasn’t cliché or predictable.